I decided to set myself a challenge. A challenge to style a tutu in a more 'casual' look. Nothing really glam, something you could maybe wear everyday. 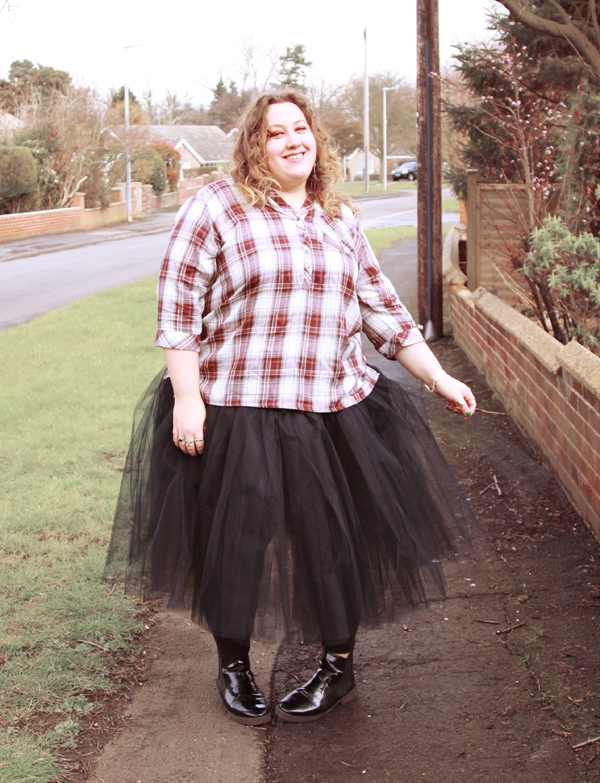 Because who doesn't want to rock a tutu everyday?! Why yes. I am the most awkward person ever. I love a good plaid shirt, and Emily in Pretty Little Liars has me really loving them even more right now. This seemed like it could be a cute combo and I think I'm right! Navabi are a high end plus size brand, and you can really tell in the materials and quality of their brands. This shirt is 100% cotton. I don't think I've ever even worn something that is 100% cotton before and it is so soft and comfy. The tutu is all black, with an elasticated waist with a tiny bow on it, and no underskirt/lining. I wore it with leggings because hey, it's cold! Plus, with no lining you are definitely flashing more flesh with this tutu. Perfect for a saucy night out, not so much for the casual look I was going for. A quick change of top and another casual outfit. I love the orange stripes in this Navabi top. Sadly this is no longer available, but there are a lot of lush orange colours in their range for Spring. In both of these looks I wore the tutu low on my hips rather than higher on my waist like I usually would, to show the different silhouette it can offer. I have become seriously obsessed with tutus and officially need everything Tutu Factory sell. 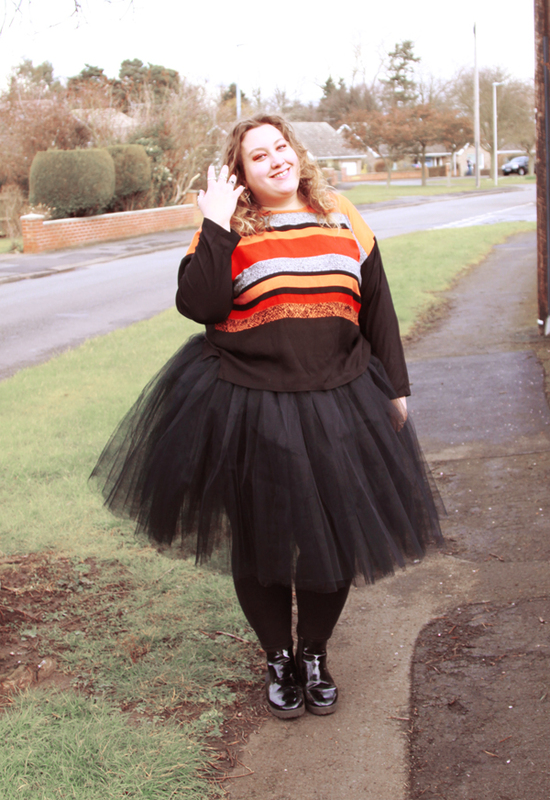 They have a plus size range up to a size 32 as standard, and will also custom make any tutu you want, in any size you want. How cool is that?! I love seeing indy brands doing good in their sizes. Their prices are so reasonable, and they offer a discount on bulk orders... you know you need a tutu or two right? *these items were gifted to me for review purposes. In no way does this impact upon my opinions, which are entirely my own. Seeing your tutu reminded me of my daughter when she was young she had a pink one for ballet classes and she refused to take it off even after the class. I didn't even know you can get adult ones. You can indeed! I did ballet for 15 years and I miss it, so wearing a fashion tutu is fun! 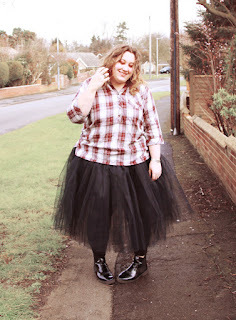 Love the idea of casual tutu's it should really be much more of a thing! You look great! this is perfect. I love mixing up fancy with casual & you've totally nailed the look. I like the look of plaid with a tutu. I just made a black tutu and I was sort of sad as it makes me look very wide hipped so I may just wear it for a photoshoot as I can stand or sit in such a way that it looks flattering. Radioactive Unicorn Nail Polish Pretties!